This year autumn progressive dinner will be on Saturday, October 22nd, 2016. Rosinka’s 150 residents dine in each other’s homes dressed in their finest halloween costume or cocktail. It is a unique opportunity to host friends and neighbors and treat them with national cuisine and beverages. After dinner the guests party till the early hours of the morning. It is a great evening enjoyed by everyone! 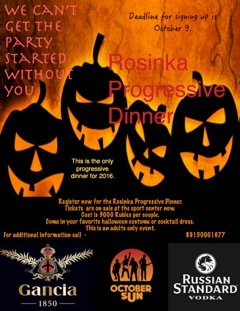 TICKETS FOR THE ROSINKA PROGRESSIVE DINNER ARE NOW ON SALE AT THE SPORT CENTER DESK. Tickets are 3000 rubles per couple. Come in cocktail dress or your favorite halloween costume.